Many of you may have heard and read about host of things related to investing in stocks. But have you practiced the right approach to investing? While equities can help you counter the inflation bug better by accelerating the pace of wealth creation, you see, it is imperative to have a prudent and disciplined approach to investing as well. 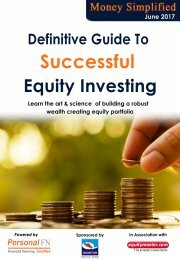 Through this guide we have captured the expertise and experience to your benefit and elucidated the prudent and disciplined way of investing in stocks; so that you make a fortune through equities.